We offer the use of eWay or PayPal to safely process online purchases. Note: Customers do not require an eWay or PayPal account to complete purchases and can use their existing Credit Cards including VISA, Master Card & American Express. Corporate customers looking to purchase in bulk should contact us directly to discuss pricing and terms (service@bodyglue.com.au). We use Standard Parcel Post by Australia Post for domestic shipping. Most deliveries should take 4-6 business days to arrive. If you require faster delivery please select the AusPost Express Shipping option on the Checkout page or contact us to discuss courier options (service@bodyglue.com.au). If your delivery does not arrive within the expected time period, please contact us immediately so we can investigate. Strongest Skin Adhesive Glue on the Market! 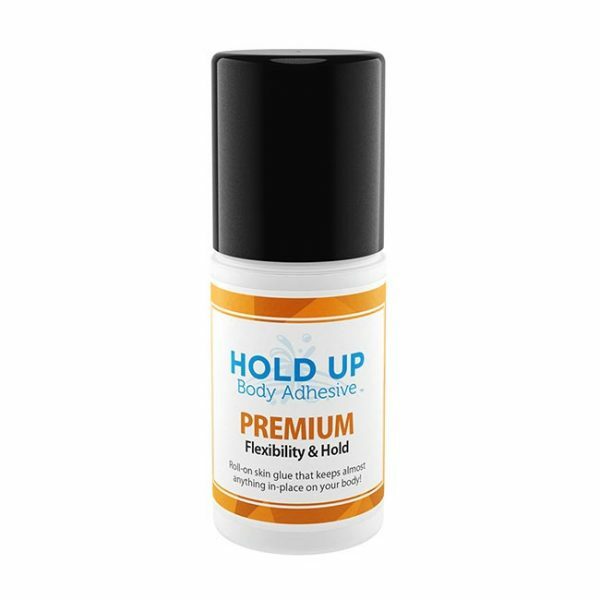 Hold Up Body Glue – Premium Formula is 30% stronger than our Original formula and is also sweat resistant for an extra strong hold during high activity. No more slipping or drooping of clothing, allowing you to get on with life without having to be constantly re-adjusting, tugging and pulling-up. The glue comes in a convenient 59ml roll-on applicator and is easily applied to the skin, drying clear. Because it is a glue and not hard like some tapes, the adhesive is pliable and moves with your skin allowing greater freedom of movement without being uncomfortable or accidentally showing at the edges of your clothes. When you are ready to remove the glue, simply pull off the clothing without loss of hair or pain, and then wash the area of skin with soap and water.